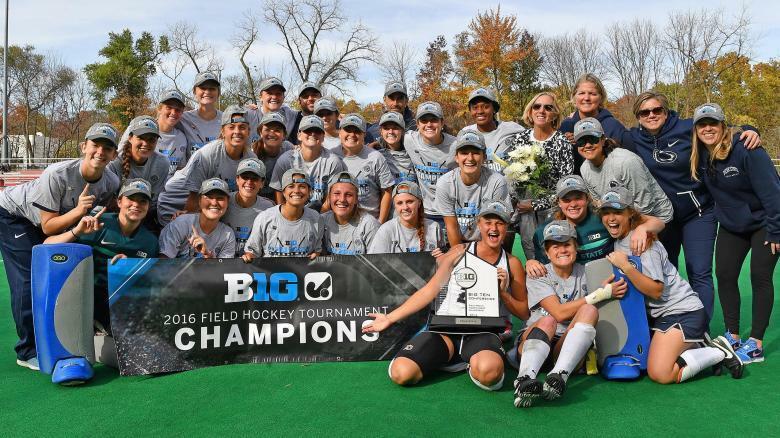 Penn State field hockey won the Big Ten Tournament over the weekend, marking the first time since 2012 that the Nittany Lions have won the tournament and earned an automatic NCAA Tournament berth. Head coach Charlene Morett-Curtis ’79 led her squad to victory over Maryland in the championship game, 2-1, thanks to goals from Aurelia Meijer and Gini Bramley. This win was significant for more than one reason: It marked the 500th win in Morett-Curtis’ time at the helm of Penn State’s field hockey program, making her the third coach in school history to win at least 500 games along with women’s volleyball coach Russ Rose (1,207) and men’s volleyball coach Mark Pavlik (522). The Lions will kick off NCAA Tournament play on Nov. 12, taking on Princeton at the Penn State Field Hockey Complex at 11:30 a.m. The two teams played earlier this season and the Nittany Lions came out on top, 4-2. Entry filed under: Athletics. Tags: Charlene Morett-Curtis, Penn State field hockey. Tigers tails between their legs, returning to Princeton. Roar Lions, Roar!